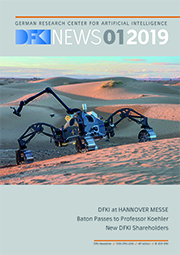 The German Research Center for Artificial Intelligence (Deutsches Forschungszentrum für Künstliche Intelligenz – DFKI) and its staff are committed to goal- and risk-oriented information privacy and the fundamental right to the protection of personal data. In this data protection policy we inform you about the processing of your personal data within the DFKI recruitment process. The purpose of data processing is the decision on the establishment of an employment relationship. For this purpose, the application documents submitted – including personal data, especially name, age, address, curriculum vitae and personality, education, professional career and position, knowhow and skills, and expectations – will be automatically processed. The processing of your personal data in the DFKI recruitment process is lawful according to Section 26 subsection 1 sentence 1 of the German Federal Data Protection Act (Bundesdatenschutzgesetz – BDSG), since it is necessary for the purposes of the employment relationship. The DFKI is responsible for the disclosure of your personal data to those who are working on the recruitment process in question, e.g. the management board, the organizational unit in charge, the human resources department, the works council, and the representative body for disabled employees. Your personal data will not be submitted to processors or other recipients, not even for the purpose of deletion or destruction. Your personal data will not be used for automated decision-making including profiling. Your original application documents will be destroyed after completing the recruiting process. All personal data will be stored 6 months after the application procedure has ended for the position you applied for and will be deleted then without undue delay. A longer storage period of your personal data is possible when it is necessary for the establishment, exercise, or defence of legal claims. You have the right to lodge a complaint with a supervisory authority if you consider that the processing of personal data within the DFKI recruitment process infringes statutory data protection regulations.